EDITORIAL – The Citizen Chronicle is here to serve our community. We are guided by an ethical code and established journalistic norms. We are watchers of history and supporters of democracy, curious by nature and rooted in our home communities. Our intention is to serve our neighbors in Southern Worcester County. Since our launch, we have set out with passion and purpose and a dogged determination to inform you of what is going on in your community. We will continue to do this even when our resources are tight, our schedules busy and obstacles fall in our way. We are honored and challenged by the work. Donald Trump’s broad-stroke claim that journalists are the enemy of the people is bold and provocative, but it is historically uninformed. It is also base and undeveloped, as are labels such as “sick,” “disgusting,” and “scum,” which have been thrown around by Trump to describe those in our line of work. As reporters, we find that hard to take. But very easy to disprove. If Trump were to listen to reason and reflect on history, he would be pleasantly surprised to learn that journalists are actually the heartfelt persistent storytellers of our democracy. But we don’t tell stories about our own political beliefs, our stance on a painful issue or our personal values. The stories we tell in our community are ones in which we step back, observe and report to inform. We are at a critical time in the history of both news delivery and journalism itself. There are endless possibilities. You can watch, read or browse news almost anywhere and at any time of the day, with the freedom to self-select your news on digital platforms. At the same time, journalists face mounting challenges, not limited to an increasing threat of violence, shrinking newsrooms and a climate of distrust in some parts. Trump continues to promote rhetoric that paints us, in an unqualified and absolute way, of being liars, criminals and, in a standby that is getting old, perpetrators of that which is “fake” or false. Journalism and the business of news reporting have been vital in Massachusetts throughout American history. Readers might be surprised to learn that Southbridge, where we started The Citizen Chronicle, has played an important role as a historical seat for journalistic enterprise and innovation since Jan. 1, 1828. On that date, the town’s first newspaper, the Reformer and Moralist, launched for readers in this region. That publication was short-lived, being renamed the Moralist and General Intelligencer and publishing its final issue not long afterward. However, that first local newspaper was the start of what has been almost 200 years of Southbridge-based journalism serving the towns of Southern Worcester County. At one time, at least three Southbridge-based newspapers competed for readership. Southbridge journalism has been guided at times by great contributors to the craft, such as Virgil V. McNitt, founder of The McNaught Syndicate or Loren Ghiglione, the respected lifelong journalist and academic. At The Citizen Chronicle, we are honored to serve in a profession with civic purpose. We enjoy sharing the stories that surround us. We will continue to do so for a long time after Trump’s dangerous, but we hope fleeting, false narrative about journalists fades into the historical notes and as the need for community journalism persists. 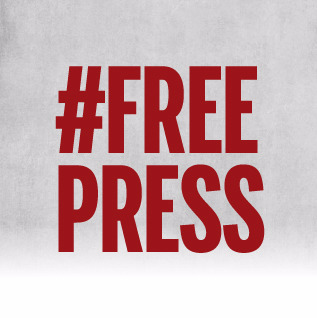 Thank you for being part of the Free Press and joining at least 350 papers speaking out today about the importance of that free press. Can you please cite President Trump’s broad stroke claim that Journalists are an enemy of the people? My recollection is that he has been highly critical of “the media”, the “main stream media”, “the Press”. Excellent Journalists often write quality stories that are then sometimes butchered and Edited, not necessarily for length or spelling errors, but to avoid controversy with government leaders, to protect advertisers or friends, and even to protect the image of the community, but the President’s counter-attack,for lack of a more gentle term, was focused on the Industry more than Journalists in general. For the first time in my 48 years of intensive observation of Washington D.C., the nation is experiencing a Presidential campaign that is neverending. With the exception of the campaigns of 1860 and 1960, the opposing party has not changed gears from campaign overdrive” back to “loyal opposition”. Like Presidents Lincoln and Kennedy, the terms “traitor” and “treason” are used with uncomfortable frequency- not only in Editorials, but during regular news segments. Is it still news if a President is reported to be guilty of a crime that results in hanging by the neck until dead when in fact collusion, even if he is guilty, is not criminal? When was Donald J. Trump’s traditional Honeymoon? The President is guilty of being imprecise. A fairer criticism is that much of the news is not as guilty of the journalistic sin of being fake as it is frequently on ongoingly guilty of the sin of omission, and due to frequent omission and editorial bias that Faux News was once famous for, the issue is not actually fake news, but fake news entities. When does a staunch political “,news” entity stop becoming news ? Certainly when it enters the field of advocacy & political public relations, “news” is a very fuzzy term. Is sharing take out with Stormy a decade ago “news”. Shucks, even if a crime was commitred, it’s likely covered by the statute of limitations. Yet ‘Uranium One’ is ancient history, but potentially SO serious is would never be covered by such a Statute. What a President says, and what is said about him or her, matters. President Trump should be less inarticulate, but I see his criticism of the consolidated media industry as a somewhat sloppy attempt at self defense. If the “Journalists” want to get their pantomantics in a bunch, they should have focused this week on protecting the First Amendment as the InfoWars team was evicted from the major Halls of social media. If President Trump ever devolves into imprisoning a third as many Journalists as President Obama did, THEN the Journalist and those of us that cherish our Bill of Rights should express serious concern. No, we should not eliminate Julian Assange, he should be awarded the Medal of Freedom.